Achieving compliance with state and federal pipeline safety regulations is an important element to preventing accidents and maintaining the safe delivery of natural gas, liquid propane gas, and landfill gas to New Hampshire end users. A major aspect of compliance involves regular inspections of pipeline facilities. New Hampshire pipeline inspectors perform inspections of state pipeline operators and enforce Commission Orders, state rules and federal regulations. In the event a violation of the regulations is discovered, imposition of appropriate administrative actions with associated civil penalties is a standard mechanism used by the Safety Division. New Hampshire inspectors also conduct accident investigations and respond to public complaints concerning pipeline operations. Results of New Hampshire Pipeline Safety Enforcement for CY 2019, CY 2018, CY 2017, CY 2016, CY 2015, and CY 2014, are included. It should be noted that time frames of closing compliance actions inherently are not standardized, allow for due process and vary greatly depending upon the situation encountered. Currently, the federal Office of Pipeline Safety regional offices inspect interstate pipeline systems for pipeline safety regulations. Within New Hampshire these facilities include Kinder Morgan’s Tennessee Gas Pipeline, Unitil’s Granite State Gas Transmission Pipeline, TransCanada’s Portland Natural Gas Transmission Pipeline, and Enbridge’s (of Canada, formerly Spectra Energy’s) Maritimes and Northeast Pipeline. A single oil pipeline, Montreal Pipeline Limited of Canada’s Portland Pipeline located in Coos County, is also regulated and enforced by the federal Office of Pipeline Safety. New Hampshire law requires the Public Utilities Commission to annually request the right to inspect these five pipelines in its annual certification but the federal government has not allowed that situation to occur. It has, on occasion, allowed very limited inspections for defined time periods. A compliance action is an action or series of sequential actions taken to enforce pipeline regulations. One compliance action can cover multiple probable violations. A compliance action may take the form of a letter of concern of future penalties for continued violation, an administratively imposed monetary sanction or order directing compliance with the regulations, an order directing corrective action under hazardous conditions, a show-cause order, a criminal sanction, a court injunction, or a similar formal action. 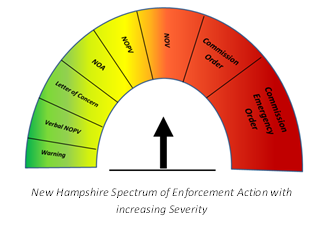 New Hampshire reports the number of compliance actions taken by the Safety Division in each year to the federal Office of Pipeline Safety. Also provided is the number and amount of civil penalties that were assessed each year to pipeline operators and the number and amount of civil penalties that were collected each year from operators. Because there are occasions where a civil penalty is assessed in one year but not collected until a following year, the amount assessed and collected in a given year may not always be the same. Safety Division originated compliance actions for the CY 2019, CY 2018, CY 2017, CY 2016, CY 2015 and CY 2014 are found here. A summary of these years can be accessed here. Warnings Informally noticed via oral comments and typically given in the field by inspectors while monitoring operator activities. Verbal Notice of Probable Violations Informal discussions of possible violations or probable violations that may be triggered typically given in the field at the conclusion of inspection as described in Puc 511.04 or Puc 513.04. Letter of Concerns Formal written letter of safety issues inspectors would like management to take notice and respond to. Letters of Concerns typically are not technically violations but may lead to violations if not addressed in near future. Notice of Amendments Formal written notice of areas where procedural manuals and company policies need clarification and improvements. Failure to not address may lead to a NOPV being issued. Notice of Probable Violations Formal written notices of probable violations as described in Puc 511.05 or Puc 513.05 of state rules or federal regulations. These require consent agreements acknowledging violations occurred but are processed in a non-adjudicated manner. Notice of Violations Formal written notices of violations as described in Puc 511.08 or Puc 513.08 of state rules or federal regulations. These incorporate the results of informal conferences and require consent agreements acknowledging violations occurred. Commission Orders Commission written determinations in an adjudicated, docketed process in which written and sworn testimony, briefs and public hearings are typically included. These proceedings do not result in consent agreements and follow administrative procedures found in Puc 200 resulting in a Commission Order. Commission Emergency Orders Commission authorities granted under RSA 374:3, RSA 374:4, RSA 374:28 and RSA 374.41 when an unsafe situation is encountered and the Commission deems it in the public good to discontinue service. This would be used in extremely rare situations involving unsafe and/or emergency conditions. PHMSA uses 9 different mechanisms for compliance actions increasing in severity as the situation dictates. Letter of Concern (LOC) This is PHMSA’s mildest compliance action serving as a reminder to the operator that observations during the inspection indicate deficiencies were found and suggest improvements to be made or can lead to more elevated enforcement actions. Warning Letter (WL) In some circumstances, PHMSA may elect to issue a written warning when it believes a violation may exist. A warning notifies the operator of a probable violation and requires that the situation be corrected, or more stringent enforcement action may be taken. A warning is often issued in a separate letter which contains only warnings (referred to as a Warning Letter). A warning does not require a response from the operator. In some situations Warnings can be included with other probable violations contained within an NOPV (see below). Reference 49 CFR Part 190.205. Notice of Amendment (NOA) If during an inspection, or through other means, PHMSA learns that the operator’s plans or procedures required by the federal pipeline safety regulations are inadequate, PHMSA can issue the operator a Notice of Amendment (NOA). An NOA specifies the alleged inadequacies and the proposed revisions to operator’s plans or procedures. The notice allows the operator 30 days following receipt of the notice to submit written comments, revised procedures, or a request for a hearing. Reference 49 CFR Part 190.206. Notice of Probable Violation (NOPV) if information obtained during an inspection or some other source indicates that a violation of pipeline safety regulations has occurred, PHMSA may begin an enforcement proceeding by issuing a Notice of Probable Violation (NOPV) to the operator. The NOPV states the specific provisions of the laws, regulations, or orders which the operator is alleged to have violated and states the evidence upon which the allegations are based. The NOPV also informs the operator of its response options necessary within 30 days, including the right to a hearing. Reference 49 CFR Part 190.207. Proposed Compliance Order (PCO) A Compliance Order may be issued to the operator, depending on the specific circumstances and is usually accompanied or incorporated within an NOPV. 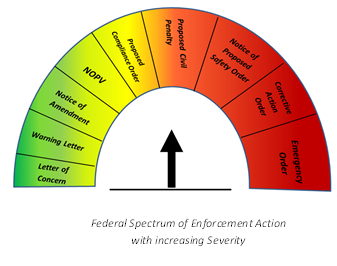 If a Compliance Order is proposed, the NOPV will specify the actions the operator must take to correct the violation. These actions depend on the violation, but could involve: modifying procedures, changing operation and maintenance practices, conducting pipeline surveillance, or repairing/replacing inoperable or ineffective equipment. Reference 49 CFR Part 190.217. Proposed Civil Penalty (PCP) A civil penalty may be issued to the operator, depending on the specific circumstances and is usually accompanied or incorporated within an NOPV. If a civil penalty is proposed, the NOPV will include the amount of the proposed penalty as well as the maximum amount for which the operator is liable under the law. The Pipeline Safety, Regulatory Certainty, and Job Creation Act of 2011 increased the civil penalty authority of PHMSA to a maximum of $200,000 per violation per day, up to a maximum of $2,000,000 for a related series of violations. Reference 49 CFR Part 190.221 -190.227. Notice of Proposed Safety Order (NOPSO) This notifies an operator that a particular pipeline facility has a condition or conditions that pose a pipeline integrity risk to public safety, property, or the environment. The NOPSO proposes specific measures that an operator must take to address the identified risk. These may include inspections, testing, repairs, or other appropriate actions to remedy the identified risk or condition. A NOPSO addresses pipeline integrity risks that may require the owner or operator to take immediate corrective actions or ones that must be addressed over a longer period of time. These orders may only be issued to a single owner or operator and are not intended to address imminent safety or environmental hazards. The NOPSO also informs the operator of its response options necessary within 30 days, including the right to a hearing. Reference 49 CFR Part 190.239. Corrective Action Order (CAO) These are only applicable to pipeline facility operators deemed to have pipelines segments considered to be hazardous to life, property or the environment. CAOs require corrective actions to be taken such as suspension of use of the facility, restricted use of the pipeline facility, required testing, required repair or replacement, required inspections and required follow-up reporting within defined time periods. A CAO usually addresses urgent situations arising out of an accident, spill, or other significant, immediate, or imminent safety or environmental concern, characteristics of the pipe and other equipment, including its age, physical properties, and manufacturing and construction information. A CAO is often issued following pipeline accidents and the operator has 10 days to respond. Depending on the circumstances, PHMSA may direct the operator to reduce operating pressure or shut down the pipeline facility until safe operation can be assured. PHMSA may also direct the operator to test the pipeline facility to identify potentially injurious problems, as well as to take other preventive measures to preclude future failures. Pipeline integrity tests are often required by a CAO and may include in-line inspection (smart pigging), hydrostatic pressure testing, or additional testing. Reference 49 CFR Part 190.233. Emergency Order (EO) This is PHMSA’s newest tool that applies not just to one operator but industry wide. The Protecting our Infrastructure of Pipelines and Enhancing Safety Act of 2016 augmented the above tools for situations pertaining to an unsafe condition or practice, or a combination of unsafe conditions and practices, constitutes or is causing an imminent hazard. This tool is necessary to abate conditions or other widespread circumstances that pose a substantial likelihood that death, serious illness, severe personal injury, or a substantial endangerment to health, property, or the environment that may occur before the reasonably foreseeable completion date of a formal proceeding begun to lessen the risk of such death, illness, injury, or endangerment. The order must articulate a sufficient factual basis to address the emergency situation warranting prompt corrective action. Reference 49 CFR Part 190.236.